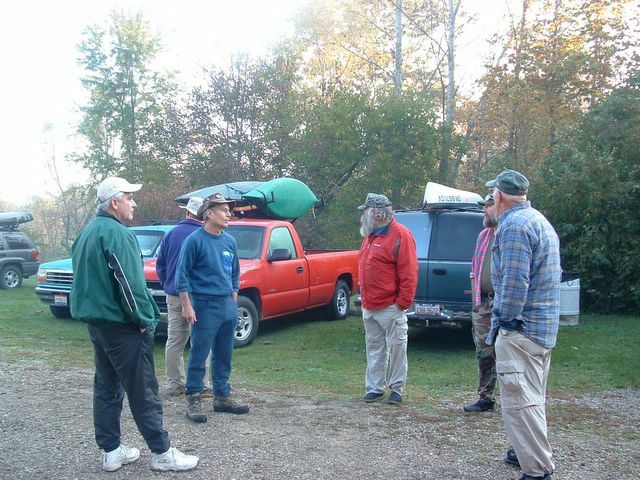 The Ohio Historical Canoe Route Associations October trip was on the Mad River the 11th, 12th & 13th. This outing was a combined trip with OHCRA and another canoe/kayak club called Southern Ohio Floaters Association or "Sofa" as they refer to themselves. We were camping at the Birch Bark Canoe Livery. I arrived right at dark at the parking lot and there weren't a lot of vehicles there, but I saw a couple kids and they told me the campsites were over the creek in the woods. Sure enough there was a nice camping area across a little tributary of the Mad, that you had to drive across or walk a footbridge across, carrying your gear, to reach it. I was going solo this trip so, since I was by myself I just slept in the truck in the parking lot. As I walked back to the camping area I saw a welcoming campfire and quite a few people sitting around it. From OHCRA there was Paul and Ted and 2 members I hadn't met yet. 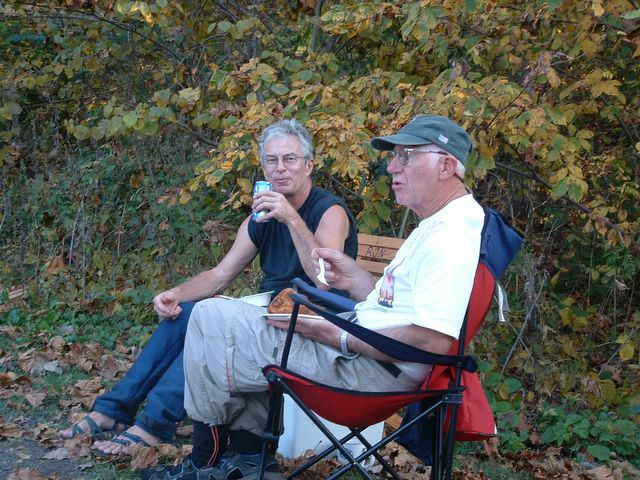 Ron and the trip leader Dave. 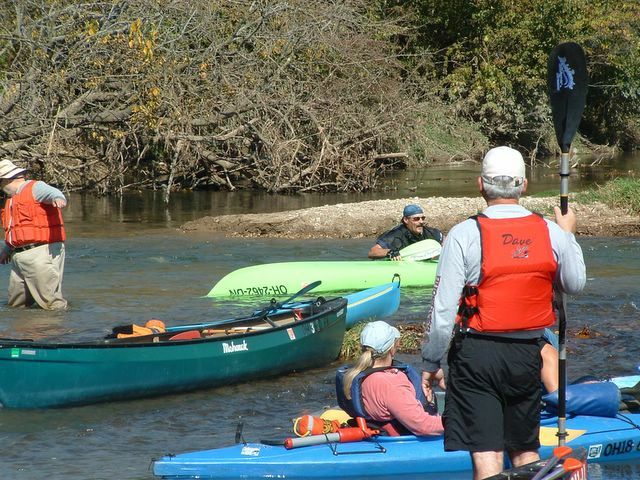 The rest of the folks were SOFA members, who by the way are "kayakers". Yes, that dirty word "kayakers". We sat around and chatted until bedtime. 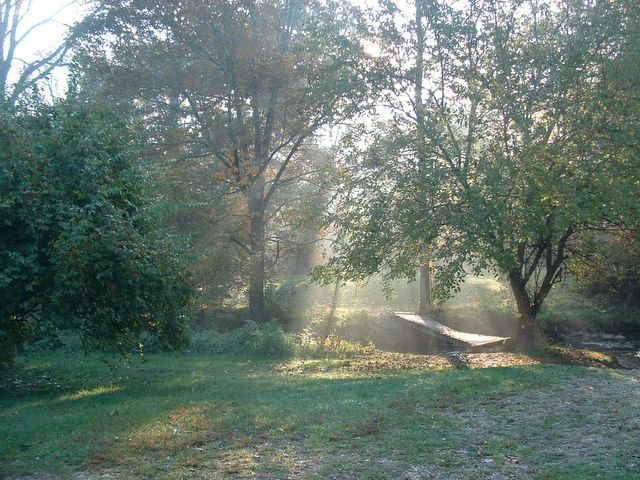 Saturday morning was beautiful for this time of the year. Short sleeve weather. Our starting point was the campground, leaving at 10:00a.m. That's a pretty late start time but I found out why. SOFA likes to eat. They cooked a full breakfast of pancakes and sausage. We got under way a little after 10, traveling a little over 9 miles all day. 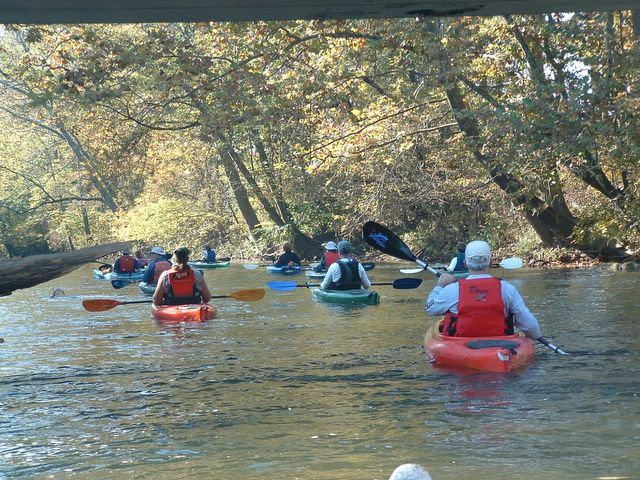 It was funny lagging behind everyone and seeing 15 kayaks and 4 canoes. I've never canoed with that many people at one time. One guy even had his dog with him. We stopped for lunch at the St. Rt. 55 bridge. Just downstream from there is that dreaded "S" curve that got the better of me in May. Now the difference in water levels from October to May made the Mad River look and act like two completely different streams. The water was so clear, still moving at 3mph but nowhere near the volume of Mays trip. Dave and I scouted ahead to check out the flow of the "S" curve (Paul didn't stop for lunch so he was already was there). What we saw looked like a nice free flowing curve. One of the kids was first to go in and she capsized. 3 more people got wet on that stretch of water. Made me feel better about my last time there. The rest of the day was uneventful until the finish point. We had to pull all those boats up a steep hill to reach the shuttle vehicles, which were parked at the Tremont Rd. Bridge. Back at camp preparations got under way for the "feast". There was deep fried chicken, beef & noodles, salmon patties, pies, cookies, heck I can't remember it all there was so much. After stuffing ourselves we reclined around the campfire until bedtime. 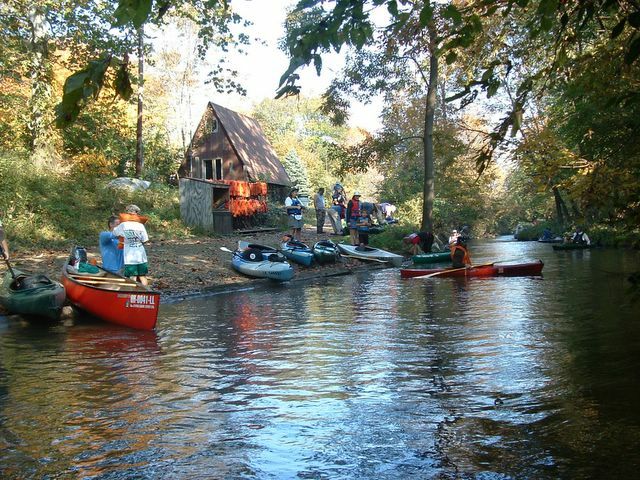 Sunday morning we shuttled 6 miles upstream and floated back down to the canoe livery. Another beautiful day for October. A nice, relaxing, easy, float trip.